If you feel overwhelmed by cold calls, you’re not alone. No two calls are the same, which makes the experience exciting and, at times, frightening. This is exactly why we’ve gathered 25 “super quick” cold calling tips to help you every step of the way. Pro Tip: Calling prospects right after they’ve opened your email can result in a 32% higher connect rate. This tool tells you when they open — in real-time. Researching your prospect should be a pre-call ritual. By tracking down key information about them, you can deliver calls with value and keep their attention. Without research, you appear selfish by showing zero investment in the person on the other end of phone. Your prospects will appreciate the extra effort made with personalization and will open up to better conversation. Write up a quick (30 seconds or less) cold call script that you can reference on the phone. The idea isn’t to read from this verbatim, but to use it as a guide to help you communicate your message clearly and confidently. Remember: The goal of a cold call isn’t to pitch to someone on the spot. You’re just trying to get them to commit to a meeting at a later date. We like to think that great salespeople do the same. 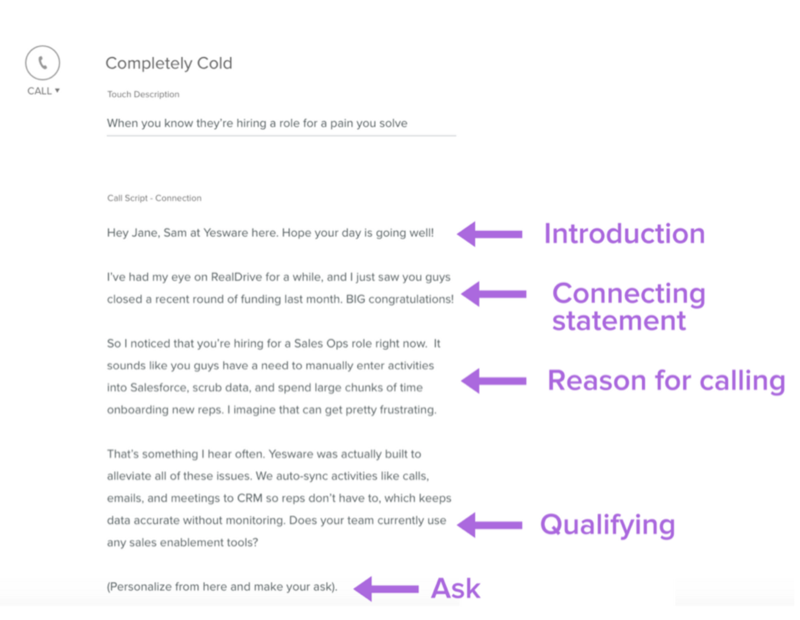 Save time by stealing these four sales call script templates and then make them your own. Do you know how many cold calls you need to hit your monthly quota? Use this worksheet to work backwards from your goals and pinpoint roughly how many cold calls you need to make each day and in total for the month. To adapt this spreadsheet for your own use, click here to open the original, then File > Make a Copy. You have ten seconds to prove to that you’re worth talking to, so differentiate yourself from other callers. After introducing yourself, turn the focus to your prospect by weaving in your research and personalizing the call. For example: You could open with a compliment on a recent professional accomplishment you came across through research. Rejection brings emotional pain. We can relive and experience social pain more vividly than physical pain, so it’s easy to get discouraged by a bad call. Don’t be defeated. Keep a positive attitude, pick up the phone and continue learning from your mistakes. Never go into a cold call completely, well, cold. Simply rehearsing what you’re going to say builds confidence which leads to better performance. The more confident you become, the easier cold calling will be. Studies show that 80 percent of new salespeople fail due to call reluctance. It’s completely normal to feel jittery before a cold call, but with the right measures you’ll be able to conquer that. Take Positives Where You Can: Regardless of the outcome, look at every call as a learning experience. Learn from the negatives and embrace what goes right. Use Essential Oils: Pick a scent that relays fond memories. Essential oils can trick your mind into moving to a place of positive power. Look at a Photo of a Loved One: Seeing someone you love makes you feel happier, relieves pain, and makes you less susceptible to anxiety. Weekday afternoons are the best time to make cold calls, according to Yesware’s analysis of over 25,000 sales calls. The majority of calls lasting over five minutes occur between 3:00-5:00 pm on Tuesdays or Thursdays. See when your emails are opened so you know when to call. Of course, research studies like the one above are great for inspiration — not prescription. We recommend using Yesware’s data as a starting point to find the cold calling time blocks that work best with your prospects. This tool books meetings for you without the back-and-forth (free trial). If you contact someone right after they sign a contract with your competitor, chances are they won’t bite. But if you know exactly when they enter the market for a new vendor and reach out before they start the search, your seemingly serendipitous call may be received with much more interest. The good news is that the secret to perfect timing isn’t really a secret. You can pick up on these opportune moments — known as trigger events — by keeping tabs on publicly available information that surfaces every day across a variety of online channels. New executive hires → A new member of the C-suite wants to prove his or her value and may be more open to new ideas than already entrenched business leaders. Winning large contracts/large customer announcements → Drop a line to say congratulations. Company expansions → A new location or geographic change could be a primary upsell or introduction opportunity. Mergers & Acquisitions → If one party is already a customer, this could be a golden opportunity to get your foot in the door and bring in add-on revenue. Funding → Your prospect is up to eight times more likely to buy from you after they experience an event where they can afford to change. Behavioral indicators → Is your prospect looking at an email you sent? Go get ‘em — you’re more likely to grab their attention while you already have it. When you cold call a prospect, the first thing you want to know is that they are in fact the person you’re trying to reach. The way you verify their identity is this person’s first impression of you, so it’s critical to get this right. Try to use the words “Talking with” when you get someone on the line. These two words imply that you and your prospect are going to be engaging in conversation. In contrast, “speaking to” describes a one-way action. It suggests that you are going to broadcast your message — whether they want to listen or not. While it may be tempting to agree to follow up over email (and hop off the call), there’s a better way to give your prospect the information they need to make an informed decision and take a meeting. One that doesn’t involve your message going into a black hole. Setting goals is proven to increase motivation and having a specific goal in mind can decrease levels of anxiety, disappointment, and frustration. No matter what your goal is, every action is a step towards achieving it. We are easily influenced by other people’s behaviors. Social proof plays a major role in selling because it shows the prospect that your product has helped other people with similar pain points. Try telling a customer success story of someone who had similar pain points. By starting your question with ‘who,’ ‘what,’ ‘where,’ ‘when,’ and ‘how,’ you give your prospect more room for response. Cold calling is two-sided conversation and you want to learn as much as you can about your prospect, what they do, and their needs. By asking how they feel, you open up more opportunity for discussion. Research indicates that 38 percent of spoken communication is comprehended by tone of voice. Without facial expressions and body cues, you can only convey your points with your words and tone of voice. People respond well to mirroring, so try to match their tone of voice or speech patterns. Your goal is to keep them on the line, so you shouldn’t open with: “Is now a bad time?” Stick with personalized statements that will keep them on the line instead of encouraging them to hang up. Fact: People spend 60 percent of their time talking about themselves. Self-disclosure produces a burst of activity in neural regions associated with pleasure, motivation, and reward. Keeping the focus on your prospect works wonders for both parties: your prospect gets to talk about their favorite topic (themselves) and you can gain their attention in interesting, unique ways. This is one of the simple cold calling tips: Don’t just talk at them. Listening is an easy way to build trust because it makes a person feel valued and it can give you the opportunity to learn more about their needs and concerns. Remember: When you’re cold calling, you’re essentially intruding on someone’s day. You have about ten seconds to prove your value and run the risk of getting hung up on. By proving that you value your prospect’s time by applying research, engaging in conversation, and keeping the call brief, you earn respect. It’s easy to get lost in the shuffle of a cold call. Engage, ask questions, but remember to stay on topic. Take notes, stay organized, and remember your ultimate purpose. Positive thinking is scientifically-proven to build your skills, boost your health, and improve your work. Much like overcoming rejection, don’t let defeat (or negative thinking) get the best of you. Every mistake you make is an opportunity to learn and do a better job in the future. At the beginning of your voicemail, insert your connecting statement (after you say who’s calling) then end with a note that triggers curiosity.